Judgement says wonderful things are starting to happen now. Forge ahead and see what the future holds – face life realistically. Trust and believe that the new vibrations will let you see exactly what you’d like to be. Take a good look at your life and you will be gifted with the vision to see ahead. You are being blessed with cosmic energies that will give you the guidance you need – be willing now to direct yourself – make all the changes you desire. You have achieved worthy goals, attained inner development and you are entering a time of serenity and happiness – a time of new beginnings. Truth will always destroy anything false. The liberating effect of life-giving beliefs will result in new patterns that will change your behavior. Beliefs emerge from the dream state as bursts of revelation – reconciling divergent ideas and bridging the gaps between your beliefs. You experience your emotions – triumphing over psychological chaos as you break through into new dimensions of awareness that are now conscious. From the source of your being you are regenerated and reborn as you recognize the true freedom that comes from the realization that you shape your own reality. As you raise yourself to a more meaningful existence now – your old ways of believing and thinking exist no more and the new requires action. Your perception is influenced by your past experiences – descend into the waters of nothingness and rise up liberated from all this partial knowledge. As your ego dies away – the illusions of isolation are dissolved and your spirit is resurrected. Coming to terms with your past experiences is a part of going beyond those experience. Allow the force greater than yourself to lead you to the true nature of existence and the way you are a part of it. Allow your true mind to awaken now. You are not experiencing new circumstances – but new consciousness. Merge yourself with the forces of life and join with all that has been separated. This search for your true identity will lead you to discover the great powers within yourself. No one can truly be free as long as another is enslaved. You can not liberate yourself until you liberate all humanity – your liberation – liberates everyone. Listen – hear the call now and make the important change. Allow the new to emerge – the old situations, your old self has died and the only thing that remains is your recognition of this fact. Use your “intuition” to its very maximum now. Allow yourself to become a motivating spirit – actively participate in the process of world evolution. Raise yourself to conscious participation in the work of divine magic. The practice of strict self-denial is a measure of personal and spiritual discipline. The work and idea of resurrection appeals to that which is most creative, most generous and most courageous in the human soul which has been invited to become a conscious and active instrument of accomplishment. What faith, what hope and what love is implied here! Forgetting, sleep and death are three degrees of the same thing – the process of eliminating a conscious, living being. Your “ego” or “waking” state – is only a weak part of the totality of your consciousness. It is the focal point of your actions, judgments and deeds and it is limited to what you are engaged in judging, saying or doing at any particular moment. The rest of your consciousness – that which is not concerned with the immediate action – is elsewhere. In order to “act”, it is necessary to forget – to dismiss those things which do not interest you, so that you can recall to mind the knowledge which will be useful. “Good concentration” is the ability to swiftly and completely chase away all images and concepts which are not useful for “action” – it is the art of forgetting. “Good memory” is the mastery of the art of recall. You easily forget what you do not love, while you never forget those things that you love. Love gives you the power to recall the things that your heart preserves as “warm”. Resurrection is morality – pure and simple. It is not an all powerful divine act, but rather the effect of the meeting and union of divine love, hope and faith with human love, hope and faith. “Thy kingdom come; thy will be done on earth, as it is in heaven” is a prayer – the act of submission of your human will to divine will. Miracles are not “proof” of the divine, but rather proof of the alliance of divine will and human will. It is the effect of the “free” union of two free wills. Emotional clearing – the acceptance, the forgiving of others and of self necessary for completion. It is the emotional reward or the punishment felt in your own heart – the reward is being able to accept and move on; the punishment is being unable to overcome your past. Correct, workable feelings about things. All duality at the emotional level is resolved, as all differences with your fellow man and creatures are forgiven, not forgotten. They must be remembered well as lessons lest you repeat your mistakes. The impact of grace on the heart. What “call” have you heard? Who or what is being criticized? What judgment is being made? What new realization is transforming you? Who or what are you merging with? What or whom are you responsible for? In the first position: Universal love is the force through which everything is judged to be of God and therefore worthy of God, as self is worthy of self. You will walk this leg of your journey being open to any who would be your friend and to those who would not, you will even be their lover. In the second position: You are surrounded by reliable situations in your material world because of your direct and efficient manner. Communication has been honest and everyone knows where they stand with you in business. Your health has prospered because there is little stress with nothing to hide. In the third position: This is a time for conscious resolution in your emotional house. Progress can be made in forgiveness of yourself and of others. The overtures are yours for the making. In the fourth position: Your early emotional imprint on which you build even today is virtually utopian, but the realizable utopia of universal love (brought to the West by the Christ) and understanding (brought to the East by the Buddha). In the fifth position: You have a good objective grasp of the situation. You are seeing things clearly and what you are planning is fair to all concerned. Now just keep it all out in the open where you can keep your eye on it and deal with it. 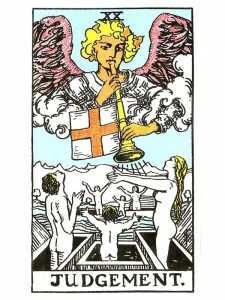 In the sixth position: The issues of judgement hit your Emotional Plane in the near future. The more universal character of higher emotions both demands and enables you to seek level ground in the give and take of your relationships. No energy debt can accrue, much less multiply, if giving and taking are according to need and ability to share. In the seventh position: Here is an opportunity for mind to help the heart with its karma. Mind can frequently identify an imbalance in your Emotional Plane, where a need for forgiveness of another or of yourself is clear, but the heart in its capacity of lower emotions will still find it difficult to clear the matter. The heart may even feel completely unable to clear. The higher mind, here in the function of a healthy conscience, is given the power to take action, to make a call or write a letter, to find the words it needs to say and in time too the heart will believe the words the mind has found for it. In the eighth position: The peace pipe is being passed. Resolution of problems in your material affairs, centering around how people have handled each other. In the ninth position: There is a mature, long-term look at the world in your creative output. Your heart is reviewing, as it likes to do often – the magic in its relationships in order to nurture it and make it grow even more, never satisfied that it has done enough, acting out of intense love not guilt. In the tenth position: Here comes a big dose of grace that helps the heart over the hurdles of disappointment, resentment and anger. Listen as the music of the spheres plays the notes that resonate in all hearts and the sense of alienation you feel will surely subside. I cannot express my appreciation enough for you taking the time to expand upon your previous work. It’s truly insightful and a real labor of love, I am sure. Thank you!